Verso comes pre-configured with sensible defaults, but it’s very easy to add custom metadata fields to the graphical interface. All metadata is embedded into the image files. This improves interoperability and avoids tool lock-in. Metadata editing is based on ExifTool, so the whole range of elements supported by ExifTool is available. 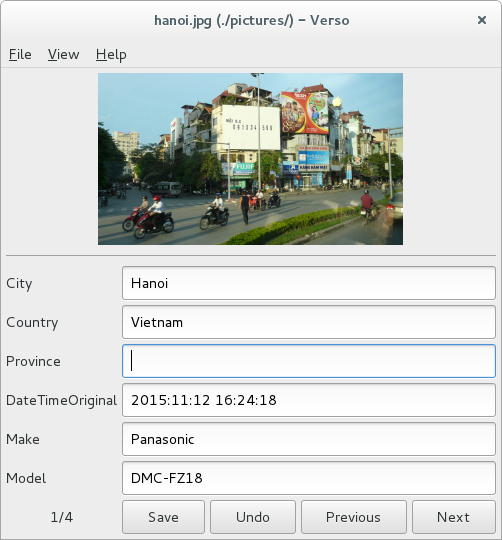 Verso is an editor for metadata embedded in image files. Metadata can be used to describe, amongst others, the image’s content and the depicted persons, to provide the date of its creation or to state license information. It can also contain technical data like shutter speed and focal length. 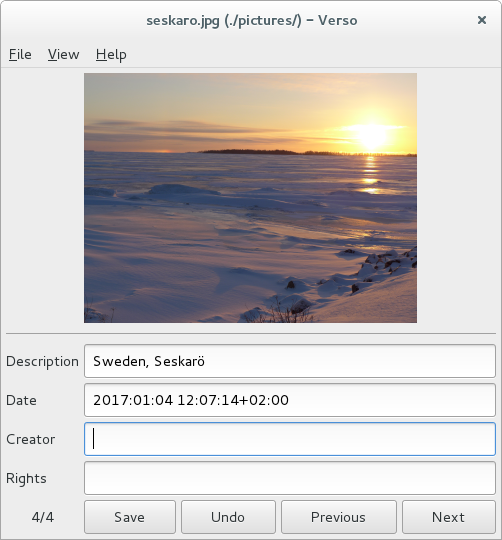 Verso’s default configuration makes it an editor for XMP metadata embedded in JPEG files, particularly for the Dublin Core metadata elements Description, Date, Creator and Rights. But since metadata editing is based on ExifTool and Verso is highly customizable you may adjust the metadata fields that can be displayed and edited, as long as ExifTool can handle them. 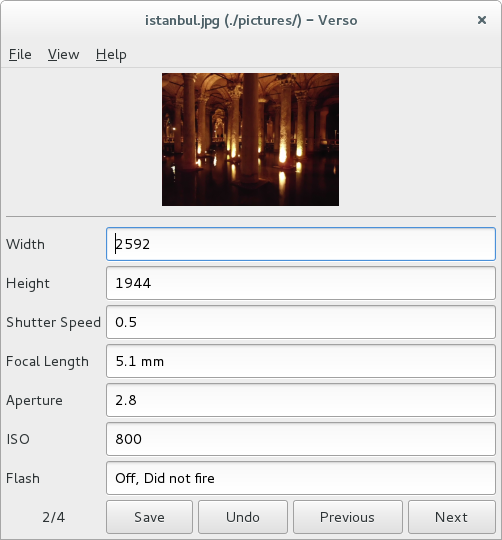 So Verso can easily be adapted to edit for example IPTC or EXIF instead of (or in addition to) XMP metadata. Metadata fields can be added in the configuration file or on the fly via command line options. What about the name? Recto and verso are the “front” and “back” sides of a leaf of paper. The metadata that can be edited with Verso is the same one might have written on the back (aka verso) side of a photo, back in the olden days of non-digital photography.